Cousins winces in pain after going down in the first quarter of Game 2. Last night, just under four minutes into Game 2 between the Los Angeles Clippers and the Golden State Warriors, DeMarcus Cousins was helped off the court after a non-contact injury to his upper leg. 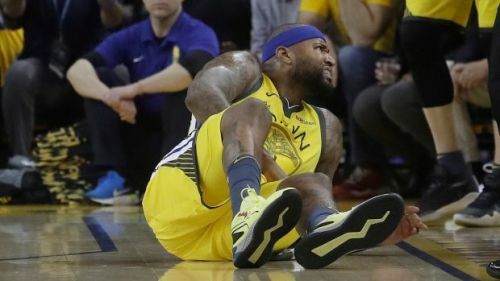 After undergoing an MRI today, which revealed a torn quad muscle, Cousins is expected to miss the playoffs with a "faint optimism" he could return for the NBA Finals if the Warriors reach that round. For the Warriors, this is not a big of a loss as it might seem. People are quick to forget that this team still has four All-Stars, five if you count Andre Iguodala. The Warriors still remain the overwhelming favourites to capture this year's Larry O'Brien trophy, which would be their fourth in the last five seasons. With Cousins out, Andrew Bogut will take over the starting centre role. Bogut was signed in March, after winning the MVP and Defensive Player of the Year in the Australian Basketball League. He was the first overall pick in the 2005 NBA Draft, and won the 2015 NBA Finals as a member of the Warriors. This is exactly what the Warriors signed Bogut for, for insurance, in case Boogie Cousins went down with an injury. As for the current series, the Warriors are coming off a devastating Game 2 loss where they blew a 31 point lead at home to the Clippers. With the momentum all on the Clippers' side, the Warriors will have to rely on their talent and experience to win a crucial Game 3 in the Staples Center. The Clippers will be riding high and coming home, looking to take a 2-1 series lead in the best of seven first round series. If Cousins does indeed come back for the NBA Finals, you can't really expect him to make too much of an impact. A torn quad muscle is a painful injury, and it will be tough to incorporate Boogie back into the offense during a championship series. NBA 2018/19: Should the league be grateful to the Los Angeles Clippers?